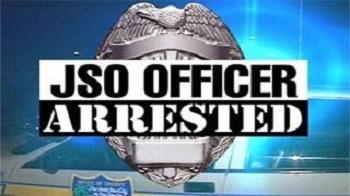 JSO Officer Arrested For Child Abuse | NOT IN MY WORLD!!!! Officer Erica Nicole McRae, 37, Arrested For Child Abuse. JACKSONVILLE, FL – An officer with the Jacksonville Sheriff’s Office has been arrested and charged with felony child abuse, Undersheriff Pat Ivey announced Tuesday. Officer Erica Nicole McRae, 37, a 12-year veteran with the sheriff’s office, is accused of disciplining her son by beating him with a plastic clothes hanger. Police said the child reported being beaten on Oct. 12 and then again the morning of Oct. 13. He went to school that day and reported the beating to a school administrator, who called the Department of Children and Families, police said. DCF contacted JSO and the child was interviewed and medically examined on Oct. 14. Ivey said there were several injuries on the boy’s arms and legs. He said the bruises were consistent with a thin, curved object, like a hanger. Opinions were split on social media Tuesday about whether the punishment went too far, but a child psychologist said physical punishment on a child is never justifiable. “The problem with (physical) punishment is it does change the behavior when the parent is around, but as soon as the parent disappears, the child will carry out that same behavior when the parent isn’t around,” parenting psychologist Dr. Justin D’Arienzo said. He said most psychologists and pediatricians would not recommend corporal punishment or spanking, even though 66 percent of Americans believe it is effective. D’Arienzo said corporal punishment does more damage than good. “There’s research that shows kids may have mental health problems or be more aggressive and also fear their parents, if the parents use those means,” D’Arienzo said. He said not all children have lasting impacts from corporal punishment but said it can increase the risk for problems. For a felony arrest, officers are given the option of resigning or going on leave. McRae has elected to go on leave without pay. DCF said it is still investigating the case and that there are no other cases involving McRae. The child is now living with another relative. Previous PostAnother Indictment Against Our Justice SystemNext PostOne Lovely Blog Award!!!! Claire, Thank You for your input!!!! I have mixed emotions about this one, but those were overruled by the second whipping. The Child had to be sore from the first whipping, and to ignore this sent a very clear signal that the fact that this Child was and could be sore meant nothing apparently. So, I had to run this post. There are many different ways to discipline a Child, and hurting a Child should always matter. Mentally or physically punishment only create fear and anger in kids. It is NEVER okay to hit, beat or threat or ignore a child. Then the ground to a difficult adulthood starts. Irene, yes Ma’am, I completely agree. Love, Respect, and Quality Time are very good building Blocks to Communication.